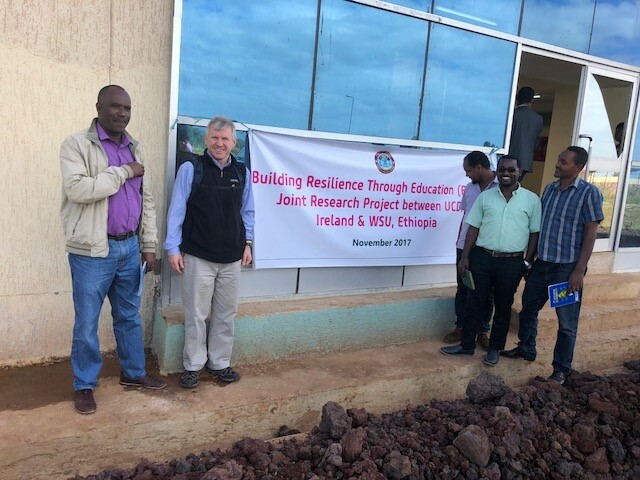 Dr. William Hynes, Managing Director at Future Analytics Consulting Ltd. (FAC), attended from 28th to 30th November, 2017, in Wolaita Sodo, Ethiopia, the launch and commencement of the H2020 BRTE Applied Research Project. This project brings together the consortium partners of University College Dublin (UCD), Wolaita Sodo University (WSU), Concern Worldwide, the international Network on Humanitarian Action (NOHA) and FAC, with the primary focus of the project being to develop innovative solutions to strengthen the resilience of communities affected by recurring disasters. The project will address the key objectives of: building the requisite critical infrastructure to enable resilience education and research; establishing an educational platform that will build human capital and transform livelihoods; and develop research and innovation capacity that will radically promote social and economic well-being. Over the coming four years, FAC in particular will be working with both WSU and the Municipal City Authority of Wolaita Sodo to assist in a collaborative and integrated approach to the sustainable and resilience planning and development of Wolaita Sodo City. For further information on this project and other applied planning projects being undertaken by FAC please contact us at info@futureanalytics.ie and visit our website www.futureanalytics.ie.